Newton’s third law of motion states that To every action there is an equal and opposite reaction. This means for every action or force that acts on an object, there is a reaction force that is equal in magnitude and opposite in direction to the action force. 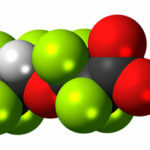 And this reaction force acts on a different object. This law is also phrased as Newton’s 3rd law. If we take a specific example: If object A exerts a force F on object B, then object B exerts a force –F on object A. The negative sign indicates a direction opposite to that of F action. The action-reaction forces always act on different objects as per Newton’s third law. In the above example action acts on object B and the reaction acts in turn, on object A. While drawing a free-body diagram, only one of the action-reaction pair of forces would be drawn for a given object. The other force in the pair would appear in the free-body diagram of a different object. As a result, the two forces do not cancel. In the above example, action force would be drawn on the free-body diagram of object B and similarly the reaction force would be shown on the FBD of object A. When we walk we apply force on the ground. This is an action force. The ground in turn applies an equal but opposite force (Reaction) which helps us to walk. As we stand on the floor we can feel our weight. This feeling of weight is provided by none but the reaction force given by the floor on us in return to the action force (our weight) which acts towards the centre of the earth. So basically the feeling of weight only comes when a surface provides a Normal Reaction force to the body resting on the surface. However, while in free fall (considering zero air drag) the weight of the freely falling body equals the gravitational force between that body and the earth. During free fall there is no immediate surface under the body where the weight gets applied (air resistance taken as zero) as an action force. Therefore there would be no reaction force as well. So the feeling of weightlessness erupts here. Details you can find here: Weightlessness. A car accelerates from rest as the car’s engine turns the wheels. The tires exert a force on the road. By the third law, the road exerts an equal and opposite force on the car’s tires. This reaction force which acts on the car through its tires, takes the car forward. The force exerted by the tires on the road does not accelerate the car. The rocket exerts a large force backward on the gas in the rocket combustion chamber, and the gas in turn exerts a large reaction force on the rocket in the forward direction. This reaction force is called thrust. Thus rockets move forward by expelling gas backward at high velocity. Helicopters push air down and experience an upward reaction force. Birds and airplanes also fly by exerting force on air. For example, the wings of a bird force air downward and backward in order to get lift and move forward respectively. Since the action-reaction forces act on different objects, they generally produce different magnitude of accelerations (considering the objects are of different mass) for the object pair. The accelerations produced would have opposite directions, but please note that we are talking of magnitude of the accelerations only. Acceleration of an object= force applied on the object/ mass of the object. When a stone is dropped from a height it exerts a force on the earth which is equal and opposite to the gravitational pull the earth exerts on the stone. 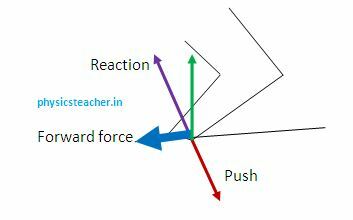 Here any one of these force pair can be taken as action and the other one becomes its reaction. Still the stone falls on the earth before the earth moves upwards to grab the stone. This is because the stone has much higher acceleration than the earth in this scenario. Details of this are available here: a stone falls towards the earth but the earth doesn’t.